With a new name and a new life, Sophie Duget hopes that she'll be able to put her demons to rest for good. It soon becomes clear, however, that the real nightmare has only just begun . . .
Young, successful, and happily married-- Sophie thought at first she was becoming absentminded when she started misplacing her mail and forgetting where she'd parked her car the night before. But then, as her husband and colleagues pointed out with increasing frustration, she began forgetting things she'd said and done, too. And when she was detained by the police for shoplifting, a crime she didn't remember committing, the confusion and blackouts that had begun to plague her took on a more sinister cast. Now, Sophie is in much deeper water: One morning, she wakes to find that the little boy in her care is dead. She has no memory of what happened. And whatever the truth, her side of the story is no match for the evidence piled against her. Her only hiding place is in a new identity. A new life, with a man she has met online. Pierre Lemaitre was born in Paris in 1951. He worked for many years as a teacher of literature and now writes novels and screenplays. He was awarded the Crime Writers' Association International Dagger twice, for Alex and Camille, two books in his crime trilogy featuring Commandant Camille Verhoeven. He also won the Prix Goncourt, France's most prestigious literary award, for his novel Au revoir là-haut, published in English as The Great Swindle. "Blood Wedding gave me a stroke: 'My God, please never let this happen to me!' This story is solidly in the realm of the possible, which makes it an even more terrifying book." "Fills the reader with doubt, makes him vacillate between reality and paranoia . . . takes us on a 300-page journey at top speed, leaving the reader staggering." 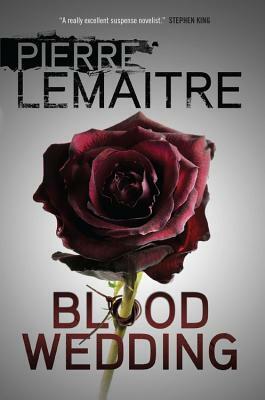 "Creepy, demented, and typical of Lemaitre's crime fiction: unpredictable in a deliciously depraved way. Readers . . . will not be disappointed. Atmospheric and chilling and packed with Lemaitre's trademark twists and turns." "Adrenaline-charged . . . The narrative is reminiscent of Gillian Flynn's Gone Girl with numerous twists and turns as the story exposes layers of motives of the main characters. Highly recommended for all mystery fans." "Absorbing and disturbing . . . The Psycho-based denouement is extraordinary." "A hyper-adrenalized shot of tension and twists, spiked with troubled psychologies and clichés deftly dismantled . . . Hitchcock would be proud." "Pierre Lemaitre strikes me as having a block of ice where his heart should be . . . This is a thoroughly frightening account of how easily and how badly an ordinary life can go wrong." "A psycho-chiller of the first order which will have you looking at even family and friends suspiciously." "[Lemaitre] has gone from strength to strength . . . The ghost of Alfred Hitchcock hovers over this one, but there's little doubt that the Master of Suspense would feel that his legacy is in reliable hands." "A scorching, serpentine novel . . . Lemaitre's skill shines from every page, supported at every turn by an elegantly constructed plot complete with elements of noir that would make even James Ellroy proud." "A tremendous standalone novel . . . Lemaitre's work is inspired and disturbing and can't be trusted. Although his novels are not normally for the faint of heart, Blood Wedding is more about psychology than violence. With precise, elegant prose, he manipulates and unnerves. Like Sophie, the reader can be sure only that things aren't what they seem." "A labyrinthine, matryoshka doll of a novel, the book's many layers will shock and astound you. Evoking novels as diverse as Patricia Highsmith's classic The Talented Mr. Ripley, and Gillian Flynn's tricky modern bestseller Gone Girl, it is a terrific page turner, one guaranteed to heighten your sense of paranoia significantly. It's an impressive bit of literary sleight of hand that keep's you guessing...building to a satisfying grand finale that most won't see coming." "A pacy, disturbing noir [that's] told in crisp, distant, almost ironic prose . . . Blood Wedding is agonizingly suspenseful and at times almost unbearably cruel, but it twists and turns with grace and verve to reach a blistering conclusion." "Smart, uniquely built, and atmospherically anxious with unreliable characters, a panic-inducing plot, and a disastrously unsettling ending."